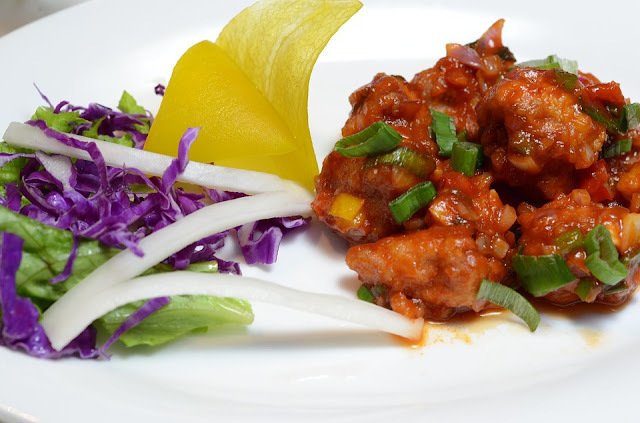 Dry, Spicy Chinese Paneer Manchurian is one of the best indo chinese recipe.This is similar recipe with Gobi Manchurian but uses of soft paneer cubes instead of cauliflower florets. You will find Paneer Manchurian and Veg Manchurian on many Indian restaurants Chinese Menu.This recipe is very simple and easy also prepare in very short time as compare to other dishes. it is an ideal food for parties as well.Let's check recipe first. Step 1 : Dice 250 grams paneer (cottage cheese)into cubes or squares.Mix maida Flour,cornflour,Salt, Garlic and ginger paste wit 1/4 cup water in bowl and mix the whole mixture well.Add paneer in mixture and let them marinate for 20 minutes. Step 2 : Heat oil in kadayi or pan.Deep frying marinated batter coated paneer cubes over medium flame until they turn golden brown. Step 3 : Drain on kitchen tissues and keep aside to remove excess oil.Don't over fry as the paneer cubes might become dense. Step 4: Turn on the flame again,Heat 2 tablespoon oil in wide-thin bottomed pan on medium flame.Add spring onion to the oil and stir fry till the onions becomes translucent then add chopped capsicum, ginger garlic paste,1 chopped green chilly and stir frying for 2/3 minutes. Step 6: Add soy sauce,chili sauce, Tomato ketchup and salt(as required).Add fried paneer pieces and spring onion,mix well.Toss everything multiple time and cook for 1-2 minutes on high flame. Finally: Now Dry, Spicy Chinese Paneer Manchurian is ready and garnish with green coriander leaves and serve. 1. Do not over cook paneer or tofu in frying pan on high flame. 2. Prepared batter should not be too thick or too thin.Thin batter will not coat paneer well and batter will not make crisp outer layer. 3.If you want a gravy manchurian then add some water.